It’s no secret that I’m a big fan of Josh Rosebrook — both the man and the brand. I’ve waxed poetic about his Hydrating Accelerator (I buy it in in multiples for home and work!) and gushed like a girl over his newly released Oculus Formula. 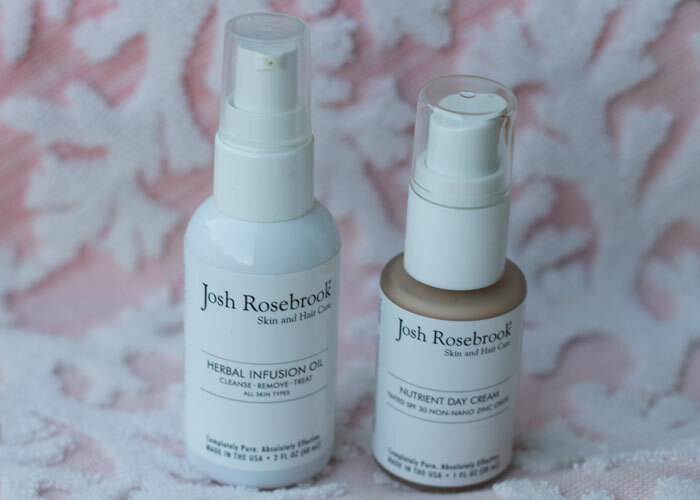 But now, I’m over-the-moon excited to share with you the exclusive launch of Josh Rosebrook’s new Herbal Infusion Oil and Tinted Nutrient Day Cream SPF 30 … and, um, give away the duos to THREE LUCKY READERS! Yeap, all caps was necessary. I’ve been testing the Herbal Infusion Oil and Tinted Nutrient Day Cream SPF 30 for just about a week now. While I’ll offer full, detailed reviews later, I can tell you my first impressions of them both during my limited testing time (I typically test for four weeks at least). I’ve used it to remove regular daytime makeup, heavy eye makeup and even sunscreen without experience redness, irritation or eye discomfort. Sometimes even the best-made oil cleansers and makeup removers that combine a variety of ingredients are just a little too much for the delicate eye area. Organic essential oils of rosewood, damask rose, and a proprietary blend of other organic essential oils round out the ingredients list. A lovely iteration on Josh’s original Nutrient Day Cream (as reviewed in my “ultimate guide to natural sunscreens“), the Tinted Nutrient Day Cream SPF 30 provides priming effects akin to a tinted moisturizer or light foundation while protecting the skin from the sun with non-nano zinc oxide. Color-adjusting earth minerals correct and brighten the skin; the tint has a neutral-pale yellow undertone that looks flawless on my skin tone. I still like to spot-correct breakouts, as the coverage is sheer/light, but it definitely does a nice job of priming and evening out the skin. If the color match is not quite right for you (whether you are darker or lighter), you’ll still get the priming benefits. It’s best to sample if possible to make sure it’s the right fit for you, of course. Or, you could just win this giveaway to see if you like it! Want to be one of the first to try these brand new Josh Rosebrook products for free? THREE of my lucky, loyal readers will the Herbal Infusion Oil and Tinted Nutrient Day Cream SPF 30 duos. Use the Rafflecopter widget below to enter the giveaway! Giveaway begins Friday, June 12, 2015, at 12:00 a.m. Central Time, and closes on Friday, June 19, 2015, at 12:00 a.m. Central Time. 3. Giveaway begins Friday, June 12, 2015, at 12:00 a.m. Central Time, and closes on Friday, June 19, 2015, at 12:00 a.m. Central Time.